Four police officers have decided to take the law into their own hands. If a suspect manages to wriggle free of a prosecution, then they dispense their own brand of justice. One case though has got under their skin. A young woman is found brutally murdered, but no suspect is identified. Four months on and the team have fallen apart, two of them leaving the police, one of them becoming obsessed with the case. Then he too is killed in a brutal fashion, beaten to death in the same house the young woman had been found. It is clear that the other three are also in danger. As they try to piece together why their friend has been slain, they start to undercover more information about the young woman and the art project she had been working on with her friends – exploring the myths of the city and how it seems like a living entity. Somehow the founding fathers of the city appear to live on and they want the cutting crew eliminated. 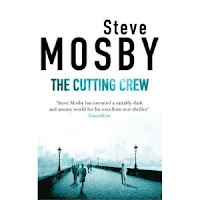 Steve Mosby’s The Cutting Crew is a crime novel with a twist. It’s not really science fiction, in that the book seems like it is in the contemporary era, though its timing is not stated, and it clearly set in this world. However, the nameless city seems other worldly to some degree, divided into sixteen districts, each named after an animal, and each with its own characteristics. Myth has it that the city was founded by eight brothers. Mosby’s narrative is dominated by two elements – the city and its geography and history, and interpersonal relationships. Both were well crafted, providing a textured, layered insight into the two principle characters – the city and the main character, Martin. The story itself is compelling, though it seems to lose its way a little in the middle. Towards the end, it twists in an unusual and fulfilling way, bringing the narrative to a satisfying conclusion. Overall, an unusual crime novel, with strong undercurrents of myth and legend.